Pain in the shoulder related to shoulder injury can develop for several reasons, including but not limited to falls, trauma, repetitive wear and tear and poor posture. In all of these cases, an inflammation develops in one or more tendons of the shoulder muscles and it can lead to pain, loss of movement and strength and can even lead to neck pain. It is important to seek treatment as early as possible with a shoulder injury because with time our bodies make several compensations to deal with the pain. If the reduced motion continues for a long period of time, it can lead to a frozen shoulder, which can take much longer to heal. Treatment for this type of shoulder injury focusses on reducing pain, getting your movement back and then on building overall strength through the shoulder. Typically, physiotherapy helps to reduce pain through various techniques including the use of machines to help decrease pain and swelling. Healing can be sped up through the use of modalities such as ultrasound and laser or manual treatment such as massage and soft tissue releases. Joint movements through the shoulder and spine are also an important part of treatment to improve the movement through the shoulder. Appropriate exercises are also important to help maintain all the changes that are expected to occur with the physiotherapy treatment. The exercises are to help strengthen the shoulder and surrounding muscles to improve the stability and functioning of the shoulder joint. It is difficult to say how long each shoulder will take to get better since there are so many individual differences. In addition, the nature of the injury itself can affect the length of time for improvements to occur. 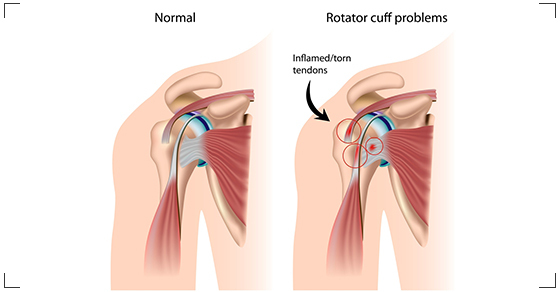 For example, a tendonitis of the rotator cuff can typically require about 6-8 weeks of treatment whereas the presence of a tear could increase healing time to 12 weeks or even longer depending on the extent of the tear. The most important thing to remember is to seek treatment in the early stages of shoulder injury to ensure the best possible results with your physiotherapy treatment.